In 1953, acclaimed author Jerome Bixby penned "It's a Good Life," a terrifying story later voted one of the greatest in sci-fi history. 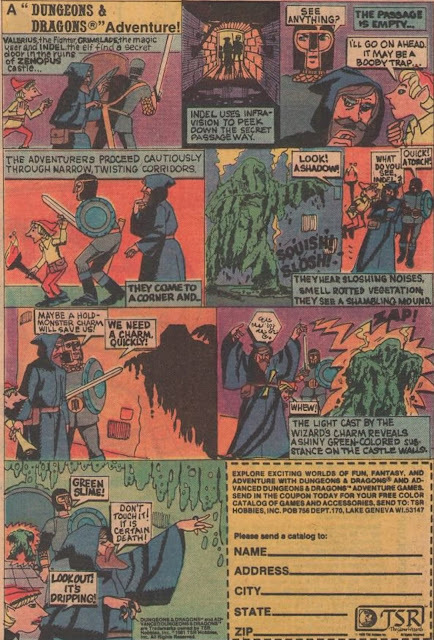 Nearly a decade after the story's publication, television legend and producer Rod Serling famously adapted Bixby's story of a God-like (or Devil-Like?) 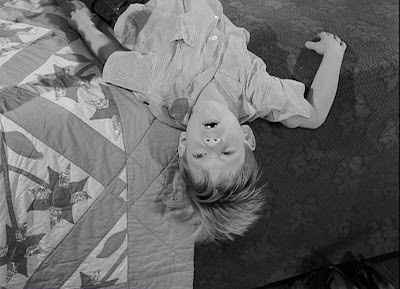 child, Anthony Fremont (Bill Mumy), for The Twilight Zone during its memorable third season. The result, which first aired on November 3, 1961, remains among the most famous -- and creepy -- installments of the landmark anthology program. 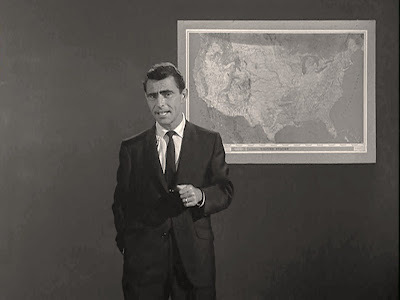 In his opening narration of "It's a Good Life," Rod Serling stands before a map of the United States and introduces viewers to the quaint little town of Peaksville, Ohio. As our guide soon relates in staccato, clipped tone, something strange happened in this little American burg. "A monster had arrived" there and the "rest of the world disappeared," leaving Peaksville in a New Dark Age without electricity; without any modern conveniences at all, for that matter. This monster, Serling quickly informs the viewers, is "a six-year old boy" named Anthony Fremont, who can make things happen...with his mind. Anthony can also "hear" what others are thinking and has a nasty habit of wishing away his enemies "to the cornfield." This frightening psychic power means that the grown-ups of Peaksville are constantly re-assuring and excusing the boy's bad behavior, so he doesn't turn his laser-like glare towards them. "That's a good thing you did, Anthony. That's a real good thing you did." You're a very bad man," Anthony tells Dan before transforming the poor sap -- in a horrifying moment -- into a living toy; a macabre, bouncing jack-in-the-box. Anthony's father then urges the boy to wish the monstrosity away to that cornfield, where all of Anthony's misshapen, monstrous creations dwell. 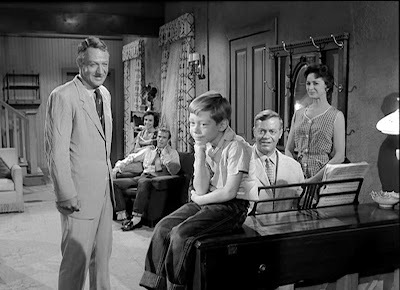 For almost fifty-years, "It's a Good Life" has resonated with generations of TV audiences, and I suppose that's primarily because the episode expresses some brand of universal truth about children and parents. When a child doesn't know limits, when a child isn't taught limits, the result may very well be a selfish, entitled monster. Not a monster who can destroy the world, like Anthony perhaps, but a monster nonetheless. When a child goes out-of-control, and the community does nothing, everyone suffers. Or as Ben Franklin once famously suggested: "educate your child to self-control, to the habit of holding passion and prejudice and evil tendencies subject to an upright and reasoning will, and you have done much to abolish misery from their future and crimes from society." Instead of confronting Anthony, the Fremonts in "It's a Good Life" just keep appeasing him over and over, refusing to acknowledge that every time they engage in this appeasement they simultaneously encourage Anthony's bad behavior. Behavior like creating three-headed gophers...that bite. I don't know that Anthony is actually evil, as some have suggested. Rather, he's merely Id unloosed. He's six, and he wants what he wants he wants, and there is no one in his family courageous enough to subject those selfish desires to an "upright and reasoning will." I have to say, Captain Kirk did substantially better addressing a teenager with the same powers, Charles Evans (in the episode "Charlie X"). As a father figure, Kirk understood he had a kind of psychological authority over the boy, even if the boy was the one with all the powers. There's no one like that in Anthony's world. One aspect of "It's a Good Life" that I still find remarkable is the meticulous attention paid to detail. Specifically, the episode's screenplay informs the audience that Anthony doesn't like singing, and that he doesn't like people to talk while the TV is on. But Anthony also, apparently, does not like art work. And if you look closely, every painting, photograph or other piece of artwork in the Fremont house is missing...sent to the cornfield, I would presume. Throughout the episode, you can see differentiations of shading on the walls, tell-tale signs of locations where picture frames once hung. Again, the episode doesn't specify this particular dislike by Anthony, but again and again we detect those rectangular outlines and variations in shading...reminding us that once upon a time, art work was present. What's the larger purpose of such a background detail? Not to sound cruel, because I am a happy father who loves his child to the moon and back, but "It's a Good Life" suggests that in having and indulging a spoiled child, parents stand to lose a lot. The "comfortable" elements of their lives (electricity, art work, music, bars of soap etc.) virtually evaporate as the child becomes the sole focus of their lives. I also have to admit, I get a kick out of the episode's not-so-veiled critique of television. There is no television in Peaksville, save for what Anthony generates from his strange and childish mind. The drama he creates consists of dinosaurs endlessly growling and duking it out on volcano tops. There's no human interaction whatsoever. To please Anthony, one of his neighbors notes, deadpan, "It's much better than the old television..." Now, on one hand, she's trying to ingratiate herself with the boy and this is an entirely appropriate remark. On the other hand, I think I hear Serling's voice there, commenting on the quality of a medium designed to sell cigarettes and laundry detergent. Perhaps the freakiest element of "It's a Good Life," -- and as a kid I was absolutely terrorized out by this -- is the fate of Dan Hollis. The episode utilizes two shots to reveal this fellow's metamorphosis into a Jack in the Box. In the first shot, we see a close-up of Dan's bobbing head, wearing a pointed cap. 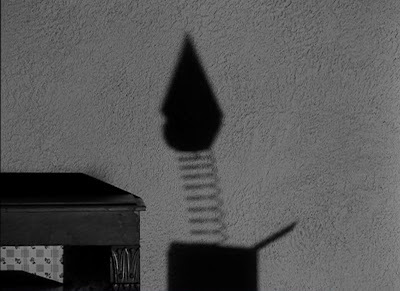 In the next shot, sequentially, we see a silhouette of Dan's head, the springs, and the box, on the wall. Somehow, this one-two punch seems more psychologically effective than seeing some special effect deployed. Because the transformation involves two shots -- and is never viewed entirely in one frame -- it's as if the viewer's brain has to assemble the pieces. And when it does, the image is grotesque and disturbing. I also love that at the denouement of the episode, Rod Serling feels no need to expand or explain any of what has occurred in the narrative during the preceding half hour. "No comment here," he says. "No comment at all." Again, I think that gets at the universality of the theme: that parents make monsters of their children by not disciplining them; by avoiding conflict. On February 19, 2003, the UPN update of The Twilight Zone broadcast a follow-up to this tale called "It's Still a Good Life," again starring Bill Mumy as Anthony Fremont and Cloris Leachman (Mrs. Fremont). In this story, Anthony was all grown up, with a daughter of his own (played by Mumy's daughter). Great flashback, John. I didn't see this when it was first shown on TV, but caught it during one of those well-known holiday marathons the local stations did. It is unquestionably one of the seminal episodes of the TWILIGHT ZONE series. I was wondering what you thought of the reprise it got in the TZ Movie? It wasn't bad (with its updated SFX), but the b&w original TV installment (with that simple and frightening effect you describe) still holds its power. Thanks for this, John. I appreciated Joe Dante's update in Twilight Zone: The Movie as a living, breathing embodiment of the director's cartoon aesthetic. In that light, I felt it was dazzling and imaginative. Not to mention scary; there's that unforgettable image of the sister with no mouth on her face. Yikes. Yet I too I still prefer the original Twilight Zone TV version penned by Serling, in part because it seems so "real;" in part because of Mumy's performance; in part because of that jack-in-the-box image. They are very different adaptations, and each has its own style and vibe, but I'm with you on preferring the less-manic, more-grounded TV version. Thank you for this great analysis,John. Probebly the most famous TZ episode, and for a good reason. I'm glad you enjoyed this cult tv flashback! And thanks for the heads-up on "It's Still a Good Life" including link...now I have to check it out! The sister with no mouth was played by Cherie Currie, former lead singer for The Runaways.